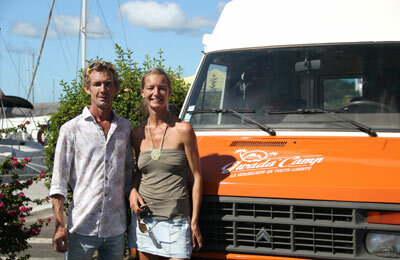 The Gwada'Camp team is composed of Ludivine MENUT and Guillaume BERTHELIN. Guadeloupe is a stop-over among many others ... Sailors, travelers, lovers of the great spaces and fortuitous encounters which were bring by navigation, we have both adopted Guadeloupe for several years. Or maybe it was Gwada that caught us ! The gentleness of the Antilles allows us daily walks in the sea and on land as a family. We were looking for a way to profit more in depth of this multifacets Guadeloupe land. The promiscuity and the freedom of the journey in furnished van meets the same expectations and compromises that the space of a sailboat. Today, with Gwada'Camp, we are happy to share this new way of stay in Guadeloupe and to link our two passions: Road-Boat-Tripper ! Think about detailing your quote request (length of stay, period, Number of people) and do not hesitate to contact us by mail. To discuss together. My stay dates are flexible.